We were definitely surprised when we heard that the Smurfs film franchise will have a reboot with "Smurfs: The Lost Village". The first two salvos, to be quite frank, were lackluster. In an era where computer-animated films have matured, the Smurfs films were stuck in a deadly cycle of generic drivel. Sadly, this is the same case for "Smurfs: The Lost Village". It will be a colorful and fun adventure for its target audience. But for older viewers, the lack of creative innovation is the sour thumb that easily stands out. With all the other Smurfs having a purpose and special talent to contribute to the Smurf village, Smurfette (Demi Lovato) has been frustrated as she fails to know what hers is. But when a mysterious figure shows up and goes into the Forbidden Forest, Smurfette and her best friends Brainy (Danny Pudi), Clumsy (Jack McBrayer) and Hefty (Joe Manganiello) go on an exciting and thrilling adventure to find a mysterious lost village before the evil wizard Gargamel (Rainn Wilson) does. In the process, Smurfette may just discover who she truly is meant to be. Even with its short running time, adults will have a hard time from drifting off when watching "Smurfs: The Lost Village". The plot and its eventual development is a generic re-thread that lacks any surprises. It's literally a point A to point B scenario and any conflicts that do arise, you can clearly see a mile away. The script also doesn't do any better. Half of the jokes and one-liners failed to connect and it even feels that the actors themselves were less than enthusiastic voicing their characters in this project. The main characters themselves are lovable and quirky but that's to be expected right? The biggest sin for the film is that it is obviously designed for a specific target audience as it is literally a film for a very young crowd and not much else. The simplistic approach "Smurfs: The Lost Village" decides to take meant that kids will find this cute enough especially with visuals and characters that pop out with vibrant colors but older crowds will be alienated with its glow-in-the-dark cave bunnies and floating-in-the-air winding rivers. 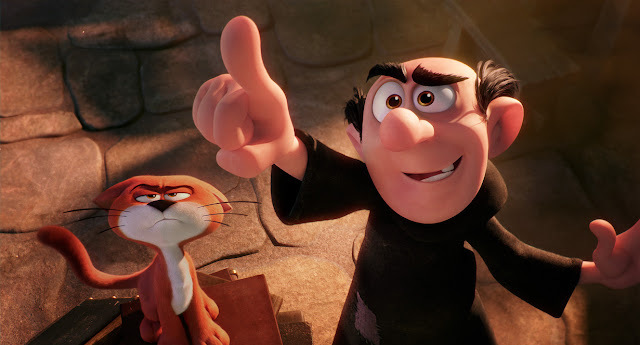 Sadly, in this day and age were audiences of both age spectrums could find animated films a compelling well-balanced experience, "Smurfs: The Lost Village" doesn't and why would parents or guardians choose to suffer when they know better?